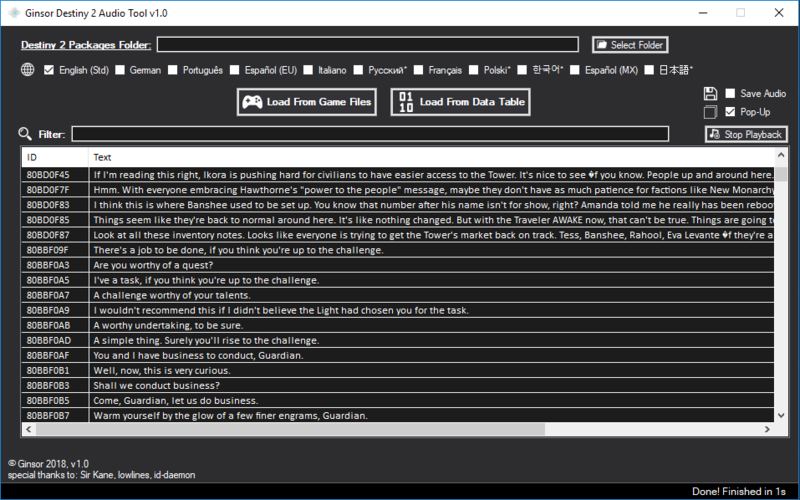 Ginsor D2 Audio Tool allows you to observe any transcript that is in the game files, showing the text dialouges and letting you playback the corresponding audio file in all supported languages. This tool doesn't change or modify the game files in any way! Read-only! While you will need the Destiny 2 PC version installed on your machine to enjoy the full feature set, you will still be able to observe the transcript texts, if you load it via a datatable (most recent ones for 2.0.4.0 are included in the download archive). * A new datatable will be generated, every time you run a scan through the game files. * You may be required to have the newest .Net runtime installed on your computer. * It's recommended to not have Destiny 2 running, when using the tool. * The selected Destiny 2 Package folder will be saved once set. * Further plans are additional information about which person is speaking. * When loaded from a data table: the text will always be in the language this datatable was generated with. The audio can be changed at any time. * In case the ID shown says "FFFFFFFF" it basically means that for this entry a text string exist, but no corresponding audio file (yet). It probably means that this text string is didn't make it to the game yet. * Unfortunately there is not a single text/audio containing the word 'Rand Transit'. * Languages marked with a star currently only have the specific audio, but English text (Russian, Polish, Korean, Japanese). * There can still be a few minor incorrect text encodings. If you find any further bug/issues, please feel free to comment below and I will try to fix it in a next version. A short How-To Description can be found in the ReadMe.txt, even though I hope it is self-explainationary. Can you release the source? Please change the "Destiny 2 Packages" folder selection to use the `CommonOpenFileDialog` included in WindowsAPICodePack (https://stackoverflow.com/a/41511598/9132176), It's a hell of a lot easier to use then the current one provided. Audio playback is kind of choppy, would be nice if it was possible to export the clips. Maybe this is a feature I didn't see?